Use these tools to get your debt-free date and find a payoff path. Then, sign up with NerdWallet to track your debts and see upcoming payments. This calculator can help you wrangle your debts. It shows your debt-free date with your current payments, then how much faster you’d get there by paying more each month. You can also compare debt snowball and debt avalanche payoff plans. When will I be debt-free? Debt snowball: You focus on paying off your smallest debt first (while paying minimums on the others), then roll the amount you had been paying on it into payments on the next largest. Debt avalanche: You pay off your debt with the highest interest rate first (while paying minimums on the others), then the next highest rate, and so on. It may save you time and money over the course of your debt payoff. Debt consolidation: Combine multiple old debts into a single new one, ideally at a lower interest rate, making payments more manageable or the payoff period shorter. There are a few ways to consolidate debt, including balance transfer cards and personal loans. Debt management plan: If you’re facing a mountain of credit card debt and not making much progress, a nonprofit credit counseling agency can set up a debt management plan to cut your interest rate and put you on a repayment plan. Should you keep paying off your debt as is, or is there a faster way to pay it off? Use this quiz to find out; having a debt strategy can save you time and money. 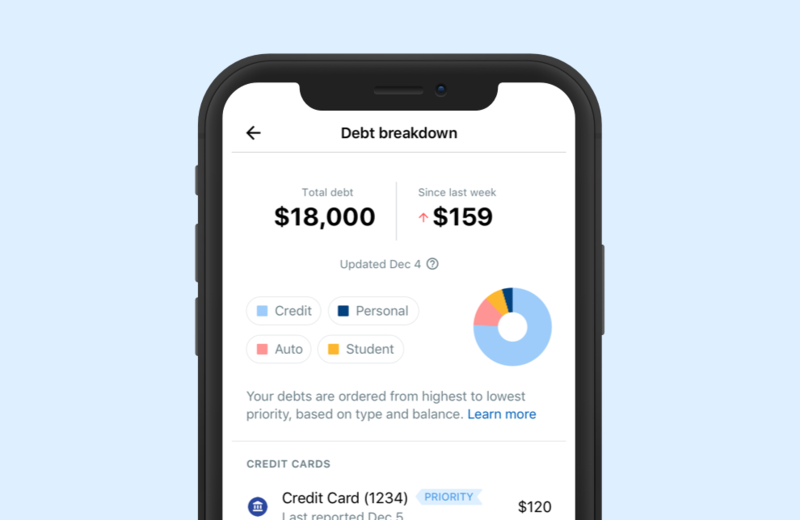 With your NerdWallet account, you can see upcoming payments, your debt breakdown by type and recent changes to your accounts. Sign up for NerdWallet to see your debt breakdown, upcoming payments and debt-free date all in one place. Really know your budget: Making the most of each dollar coming in and going out will help you stay focused as you pay off your debt. Lower your bills: By cutting what you’re paying toward bills every month, you’ll have more cash to put toward your debt payoff. Make more money: Pick up a side hustle or two and increase your earning power. Some can be done online and have flexible hours. Consider consolidation: Debt consolidation, with a personal loan or a credit card, can lower your interest rate so you’re putting more money toward your balance. Don’t be afraid of debt relief: If you’re not making any progress on your debts, you might want to get some help in the form of debt relief.